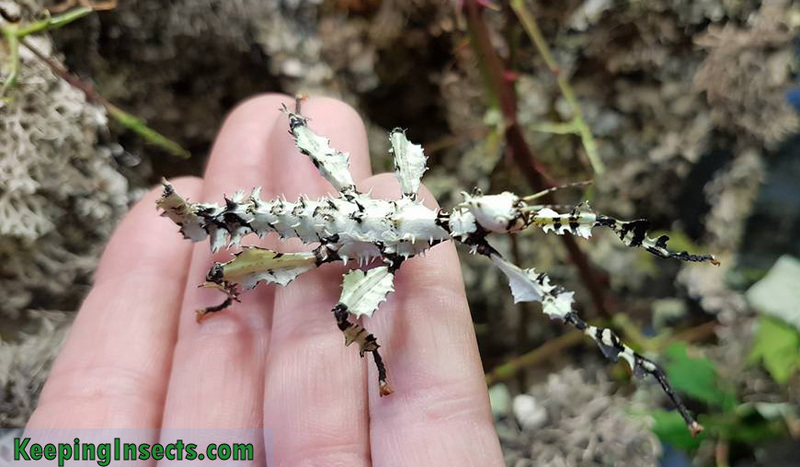 The Giant Prickly Stick Insect (Extatosoma tiaratum) from Australia is a very popular stick insect as a pet. It is big, pretty and very easy to rear. You will mostly find this species of stick insect in colors of brown. Uniformly light brown or light brown with some darker spots are the most common colors. But did you know you can also raise green or even lichen-like individuals? 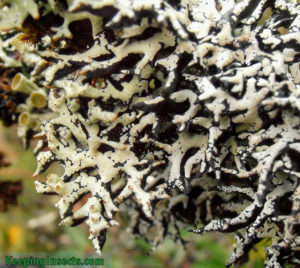 Especially the lichen variety is very rare and very impressive. They are white to white-green with black spots. Check the pictures out! Anyone that is keeping Giant Prickly Stick Insects can create some individuals in this color. The difference in color is not due to genetics, but due to environmental circumstances. It is possible that some genetic stock has a greater tendency to turn into lichen morphs, but all Giant Prickly Stick Insects can do it. The colors a young Giant Prickly Stick Insect nymph experience around it will determine the colors it will show. Of course it can only show colors that are in its natural capabilities, so a purple Giant Prickly Stick Insect is out of the question. But green and lichen are both color patterns that are possible for this species of stick insect. 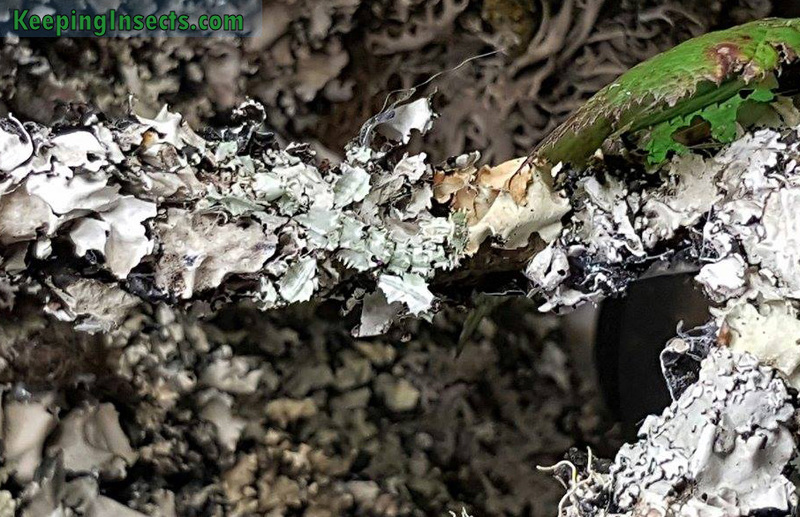 Lichen is a common part of the natural environment of Giant Prickly Stick Insects in their habitat in Australia. 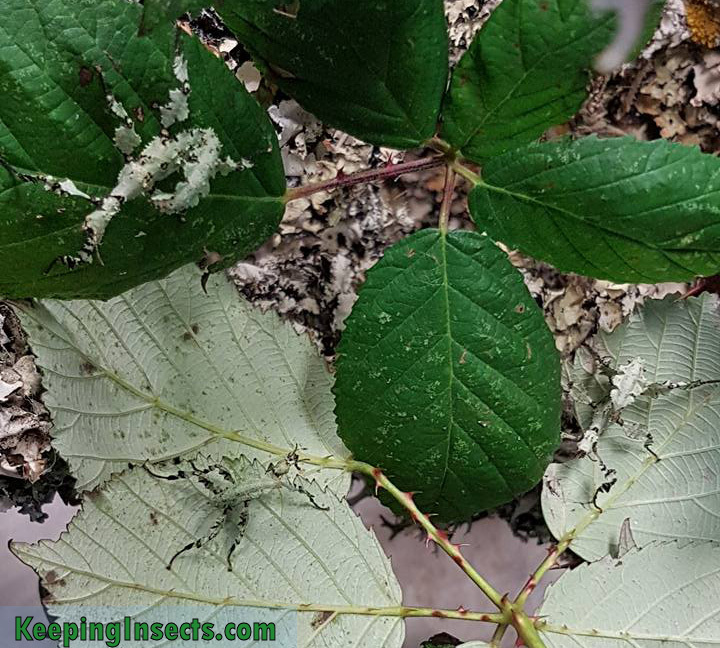 Adopting the lichen color will therefore help the insects blend into their environment. 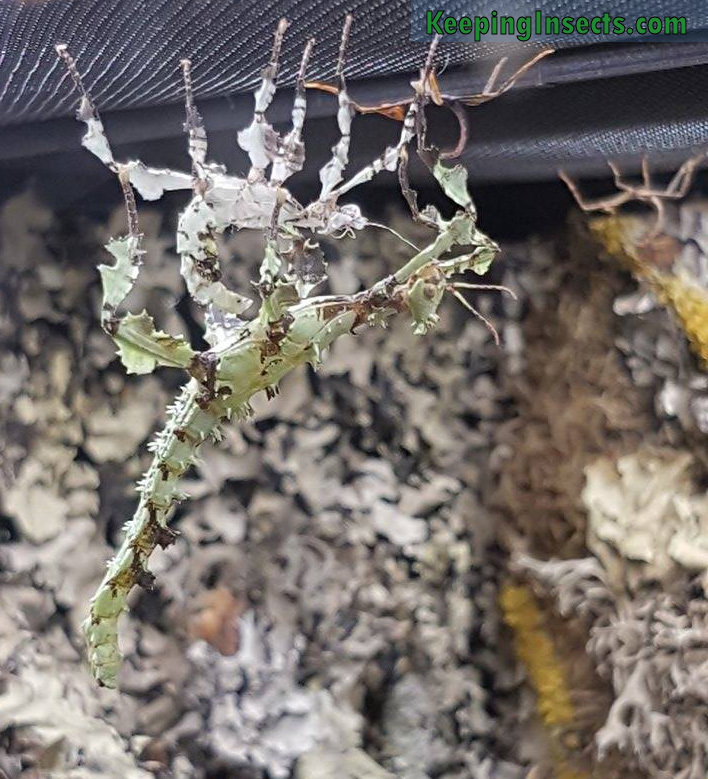 It’s easy to create lichen-morph Giant Prickly Stick Insect nymphs. 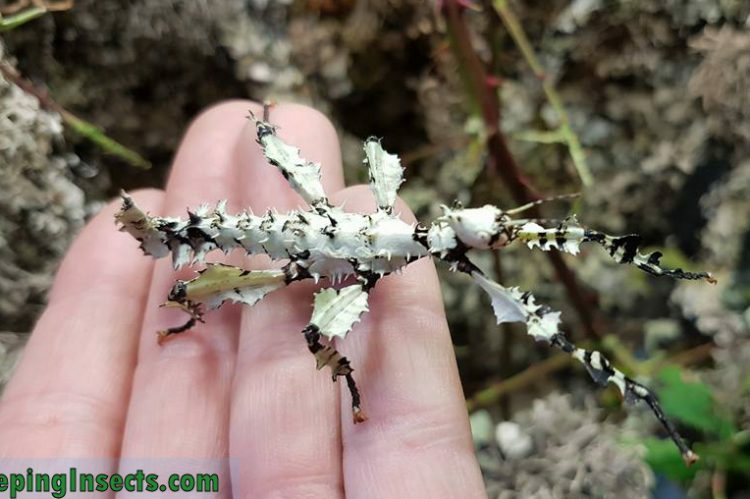 You just need to raise Giant Prickly Stick Insect nymphs since birth in an enclosure full of lichen! Some of the nymphs will molt into lichen color morphs, you will notice this at the first molt. 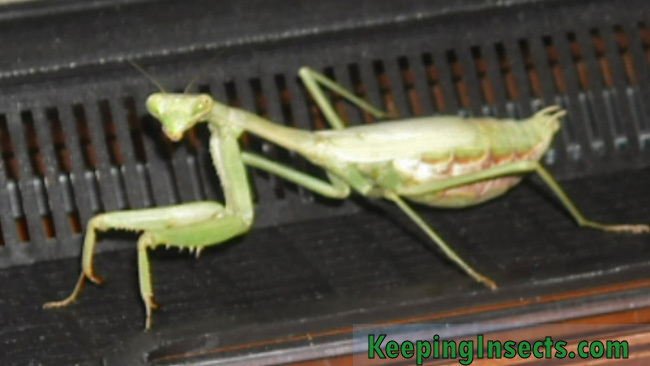 Others will molt into the green color morph and some will not react at all and stay light brown or mottled brown. Only female nymphs will show the lichen color morph. When the nymphs are not lichen in their first molt, it is unlikely that they will do so in subsequent molts. 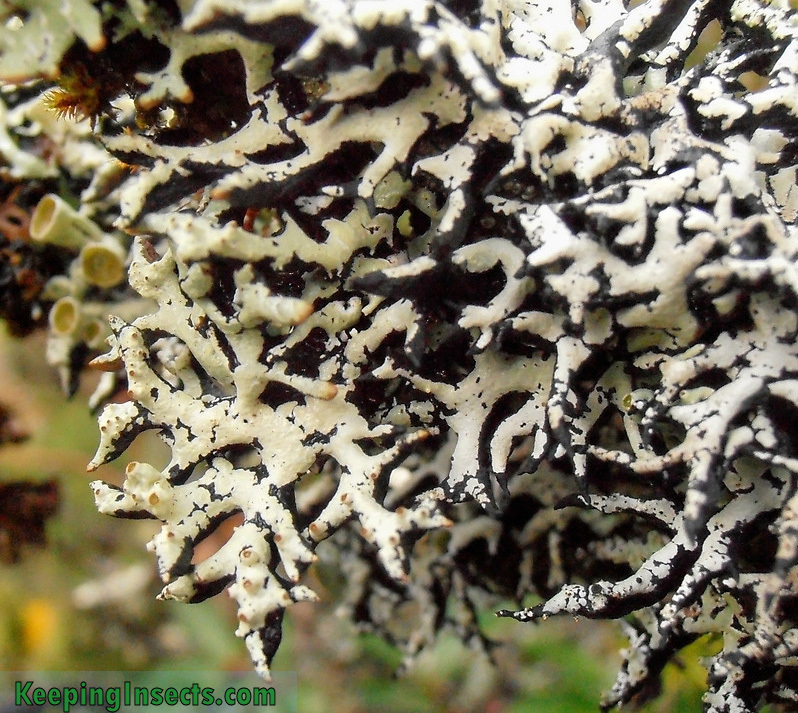 When the insects reach adulthood they will not stay in their lichen colors. The lichen nymphs will end up as green adults. When a lichen nymph molts it will appear a little bit greener, this fades back to white after about one day. The more common color for a Giant Prickly Stick Insect nymph. 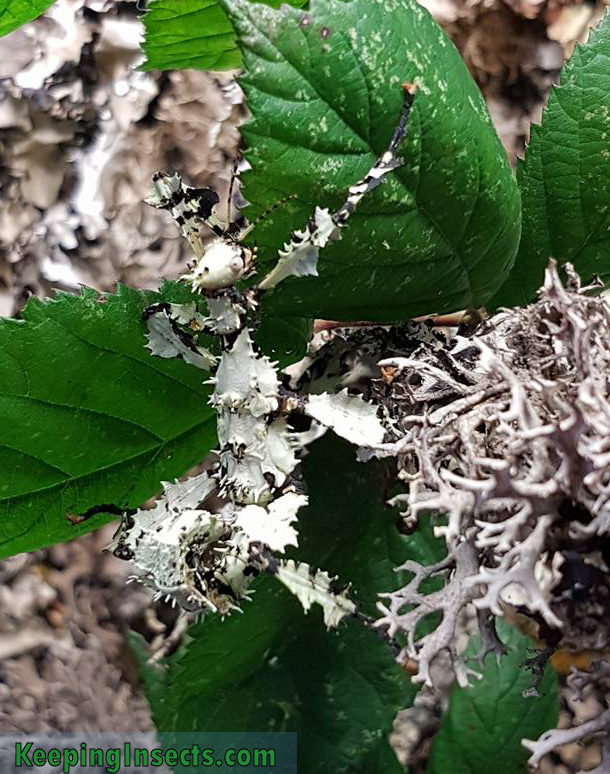 A lichen color morph just after molting. Just after molting they appear more green, this will fade into white again. 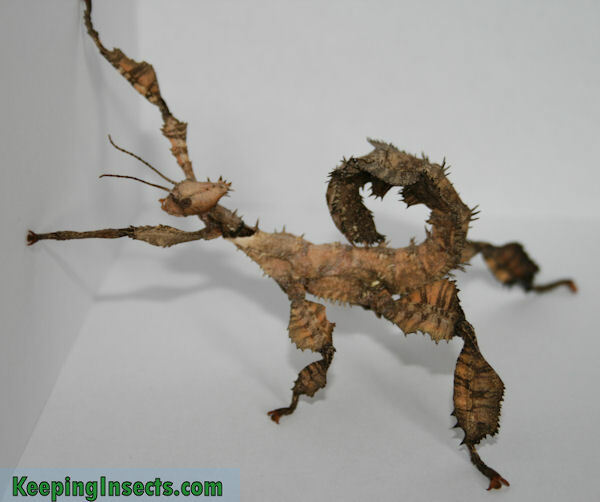 Do you want to know how to raise Giant Prickly Stick Insects (Extatosoma tiaratum)? Check out their page. Stick insects eat fresh leaves, so you will have to find a way to provide this for them. It’s generally not for sale at the pet shop! Luckily you can find fresh leaves in most countries all year round. Even in winter you’ll be able to find it. Firstly: what does your stick insect eat? Not all species will eat the same. The most common stick insect, the Indian Stick Insect, eats ivy leaves. Ivy is evergreen so will keep its fresh leaves all year round. Ivy is also easy to keep indoors, so you could even just have a pot with an ivy plant indoors. So it’s easy to find these leaves. Most stick insects do not eat ivy, but will eat another evergreen plant: bramble. Bramble will keep its leaves in winter, but not all of them. When the winter will get really though, it will lose most or all leaves. Therefore you will have to look for bramble bushes in areas with some protection against the cold. Like under bridges, in parks or close to buildings. You’ll generally still find some bramble leaves. 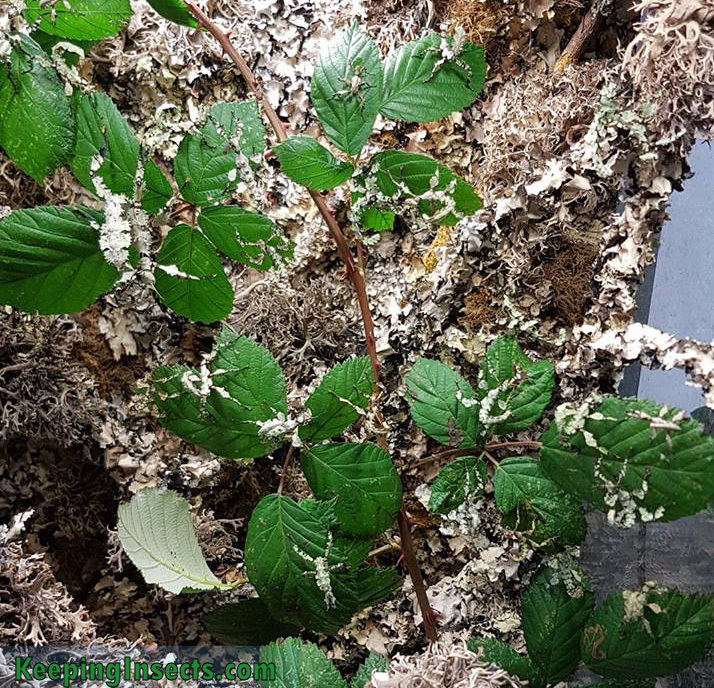 If you know cannot find any bramble leaves in winter, because you live in a really cold area, you should prepare yourself before winter. You can cut bramble leaves and branches and freeze them in your freezer. When you thaw them they will not be as fresh, but the stick insects will eat them. Alternatevely you could keep cuttings in a jar of water in a cold, non-freezing area like your garage. The leaves will stay fresh for some time. If you are really having trouble finding leaves in winter, you could buy organic rose bushes at your garden center. These organic bushes are not sprayed with insecticide and thus are safe to eat for your stick insects. If your specie will eat bramble leaves, it will also eat rose leaves. This will get them through the winter months. When spring arrives you should not feed the fresh new bright green bramble leaves to your stick insects. 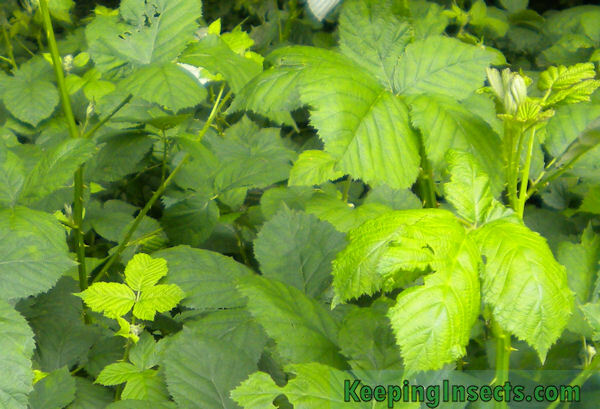 These fresh leaves contain a poison that could kill your insects. Keep on feeding the old dark green leaves until the new leaves are larger and less brightly colored. Then they should be safe to eat for your critters. You can read more about the different food plants at our Food Plants page. 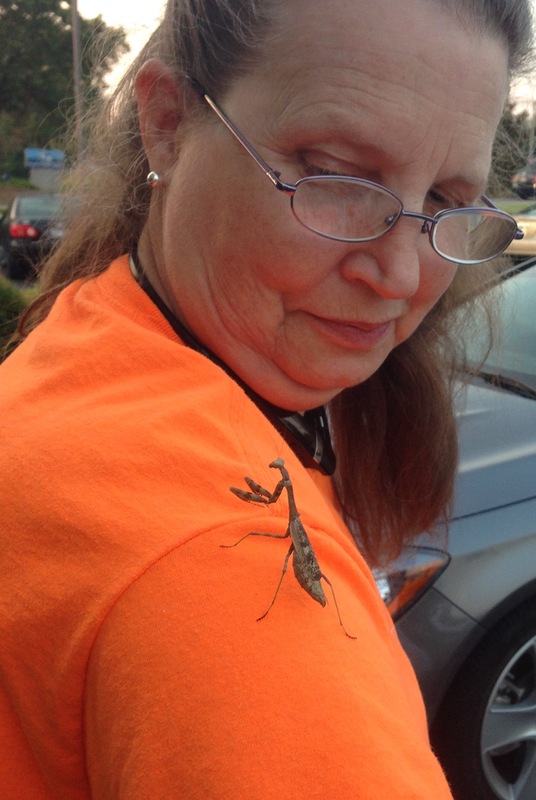 I had a Praying Mantis land on me. I am sending a picture that was taken of it on me. I was wondering what species it was. I think it was male one time I look at it and a female the next. Can you tell which it is? With the picture it was easy to identify it. It is a female Carolina Mantis. It’s occurs naturally in Kentucky and other places in the US. Around this time you will be able to see many adult Carolina Mantises around. They are producing eggs that will survive the winter. The adults will die coming fall, when they have reached the end of their life, temperatures have dropped and food has become scarce. In the spring the eggs will hatch new mantis nymphs to continue the cycle. Thank you Rosemary for allowing me to use the picture. 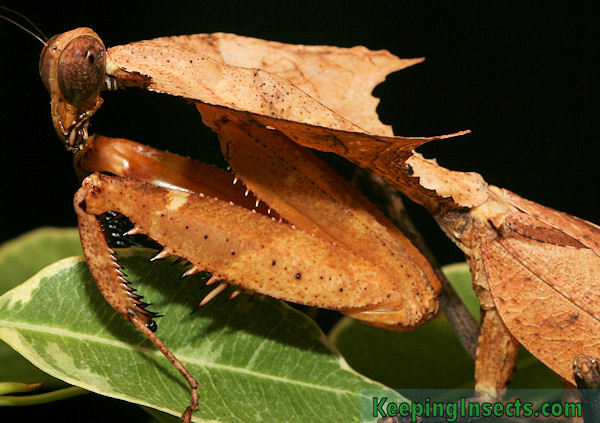 There are many mantis species that mimic dead and dried leaves. It’s good camouflage in their natural habitat. 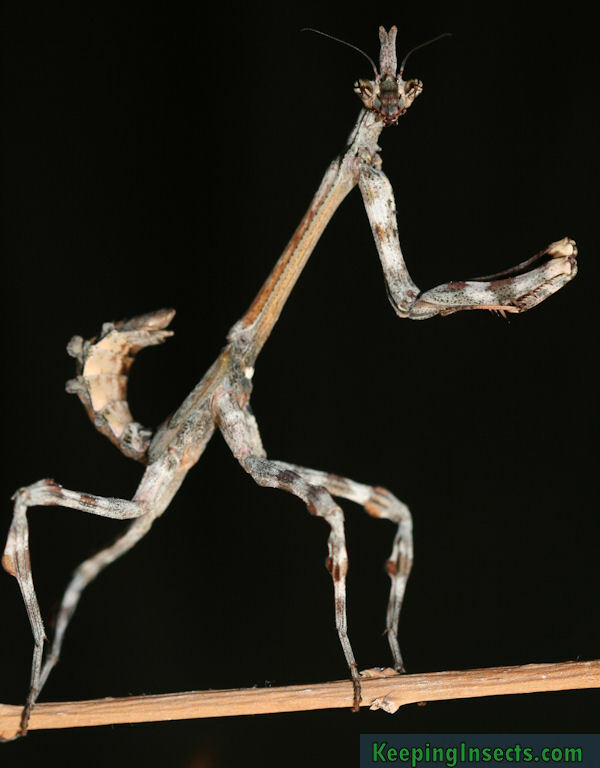 But in my opinion, one mantis species is the master of disguise when it comes to leaves: the Dead Leaf Mantis Deroplatys desiccata. Even its Latin name has to do with dried leaves, desiccata means dried. 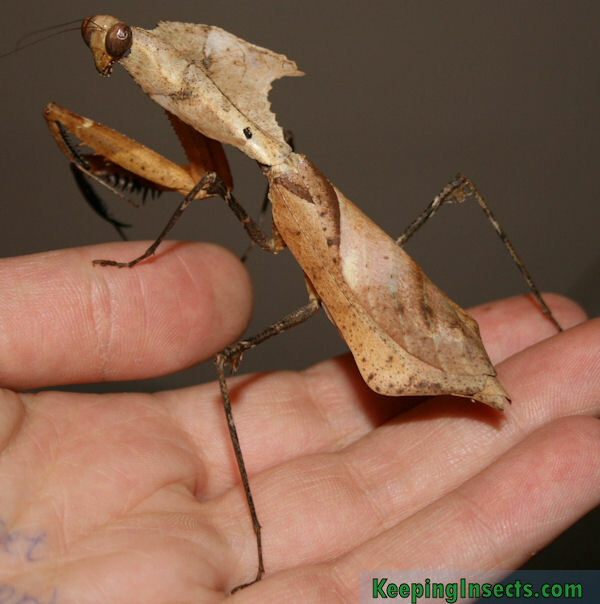 This is an adult female Dead Leaf Mantis. The females are the best in looking like a leaf. That’s because they are much larger than the males and have longer leaf-like flabs on their body. The males of this species also look like a leaf, but much less so, as they need to be more aerodynamic as they fly. Females do not fly and thus don’t need to weight in the pros and cons of looking more like a leaf. They go all-in! If prefer to photograph the females of the Dead Leaf Mantis. I just think they are beautiful. 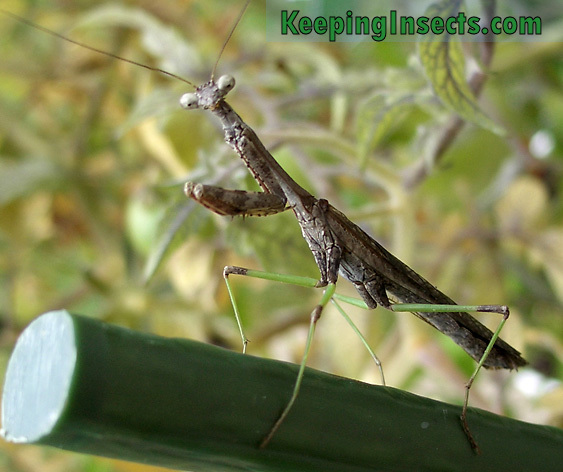 To read more about this mantis species, check out their page. Scientist are interested in the freakiest things. And sometimes I’m interested in that too. For example praying mantis 3D vision. If you own a pet mantis you can see that it probably does have excellent 3D vision. How could it otherwise grab a fly perfectly out of the air? Or why would it rotate it’s head like it does if not for a clear 3D view with both eyes? But everything is speculation until you prove it. That’s what scientist at the Newcastle University did. With tiny 3D glasses they proved that praying mantises have and use 3D vision. 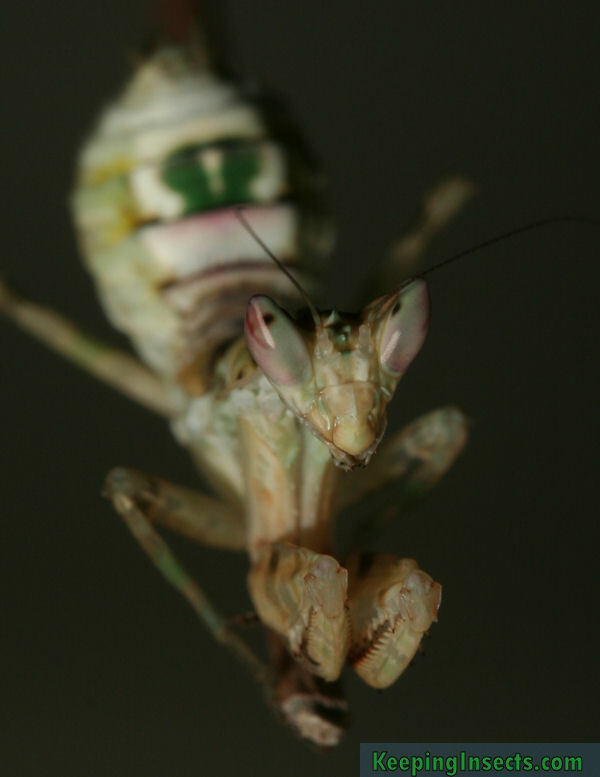 The praying mantis is the only known invertebrate with 3D perception, however this fact was originally proven in the 1980s using prisms and occluders, which only support a limited number of images. 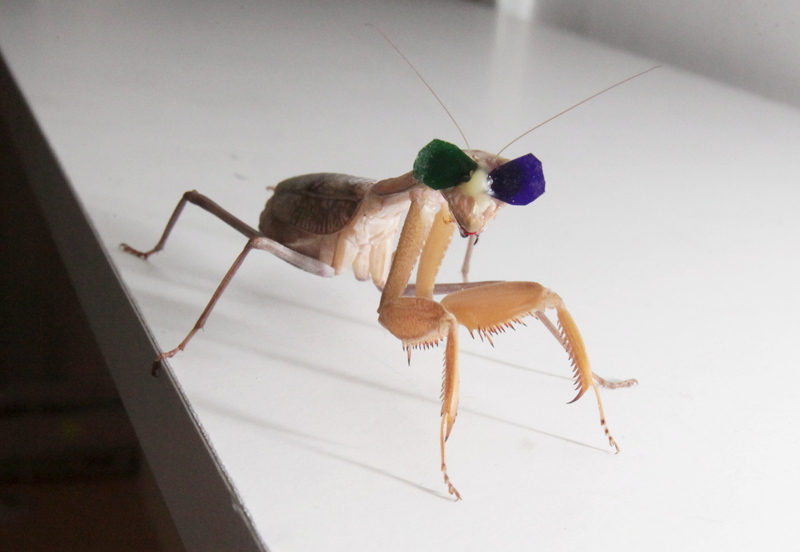 Scientists want to deepen their understanding of the insect, so they’ve taken this research a step further by testing a few mantises with tiny 3D glasses. A team from Newcastle University created a miniature cinema in the hope that the insects would move when they perceived 3D images with the appropriate lenses. The trick worked, but only with a specific kind of spectacles. 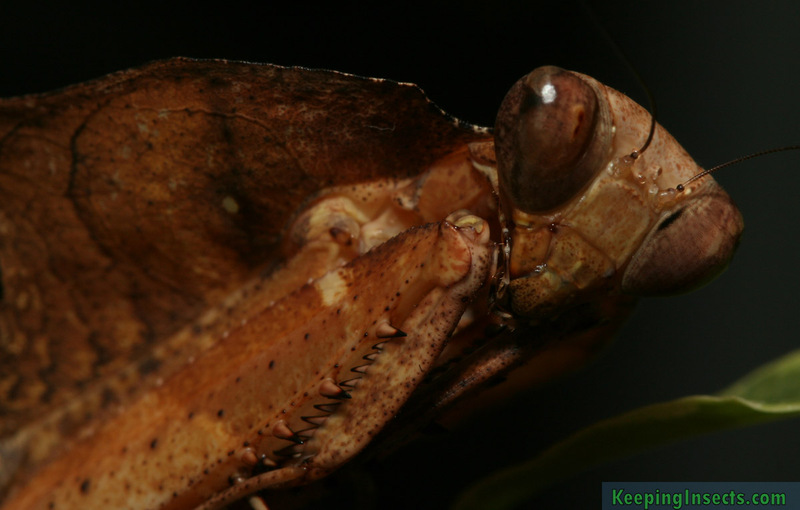 How do stick insects defend themselves? Stick insects are the favorite food of many animals. 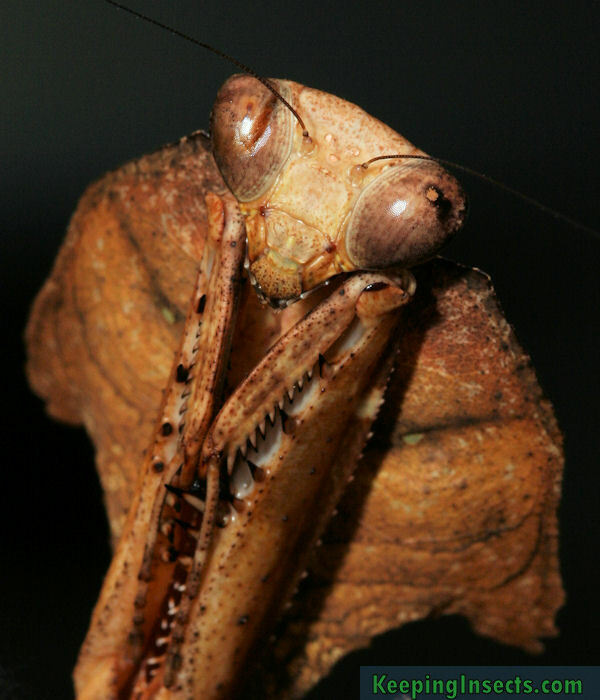 All sorts of birds, lizards and mammals like to eat a tasty stick insect. How does one prevent to be eaten? 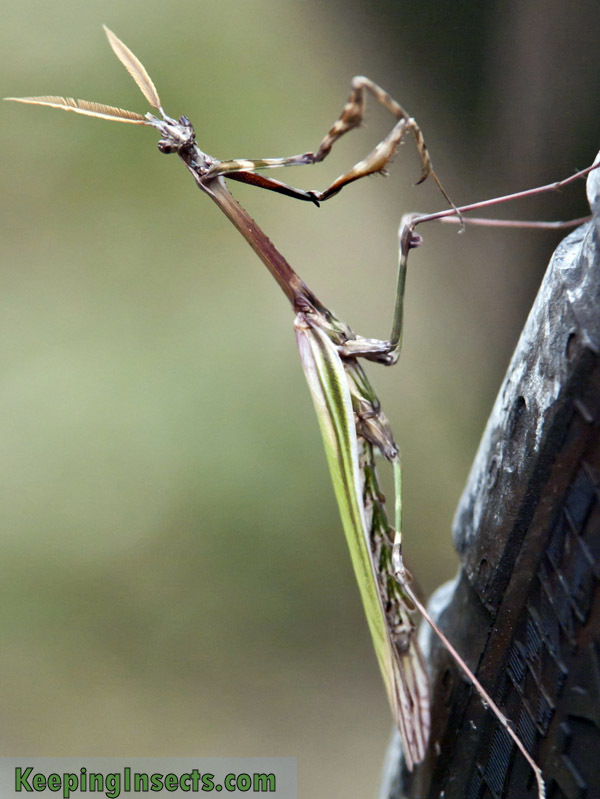 To prevent being noticed by predators, a stick insect can look like a stick or leaf. Most stick insects use this method to prevent being eaten. Some stick insect species have spikes and thorns all over their body. This makes them difficult to be eaten by small predators. Some stick insect species can even pinch with spikes located on their hind legs, sometimes allowing them to fight off a predator. 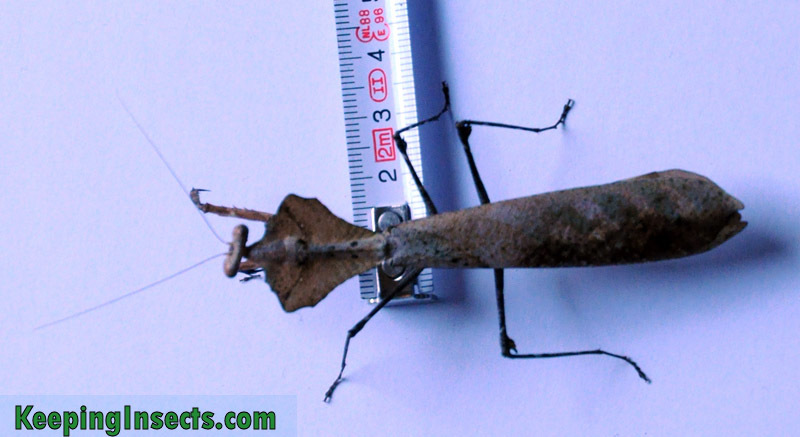 Some species of stick insect are able to produce sounds with their wings or legs. 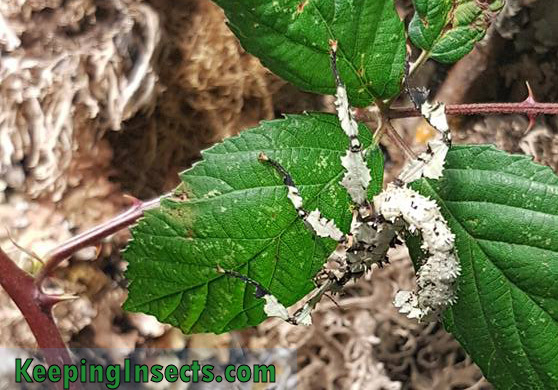 This can deter predators, especially predators that are young or that are unsure if a stick insect is proper food for them. Most stick insects with bright colors are also poisonous. Poisonous stick insects are toxic when eaten. There are no venomous stick insects (they have no toxic bites or stings). Unually the toxins also taste bad. Poisonous stick insects often have bright colors, so the predator is warned before it takes its first bite. The toxin could be deadly to the predator, but usually it just makes the attacker feel sick or irritated. Some stick insects, like Peruphasma, can spray an irritating substance from glands on their back onto their attacker. This can irritate skin and eyes, allowing the stick insect to deter predators long enough to escape. The following video shows a stick insect with bright colors. It also produces a warning sound with its wings in the video. The species name is Achrioptera fallax and it is a poisonous species. It’s time to showcase one of the mantis species. This time it’s the Indian Flower Mantis. The Latin name for this species is Creobroter gemmatus or Creobroter pictipennis. Both species are very similar, making it difficult to determine which species you have. For breeding it matters with species you have, as they are unable to interbreed. Read our caresheet of the Indian Flower Mantis to learn more about this species. More full size pictures of the Indian Flower Mantis? Click Continue Reading. Does a praying mantis bite? Many people ask me: “Does a praying mantis bite?” or “Can a praying mantis bite me?”. Well, it can, but it likely won’t happen. It’s big enough to bite you, a mantis that is shorter than 2 inches won’t be able to bite you. 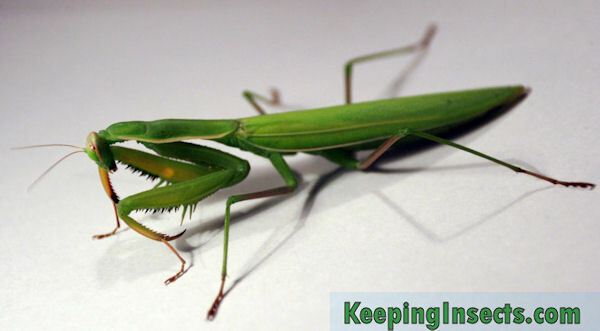 A praying mantis does not bite to defend itself against people. If it shows that it feels threatened by assuming a defense posture (called deimatic display behavior) you should leave it alone to calm down. It once happened to me that my mantis bit me. I had been away for the weekend and came back home to my mantises. It had been a bit warm that weekend and the mantises were thirsty. I took out one of the mantis older nymphs and let is walk on my finger. Then it felt the moisture on my skin, it bent down to drink. 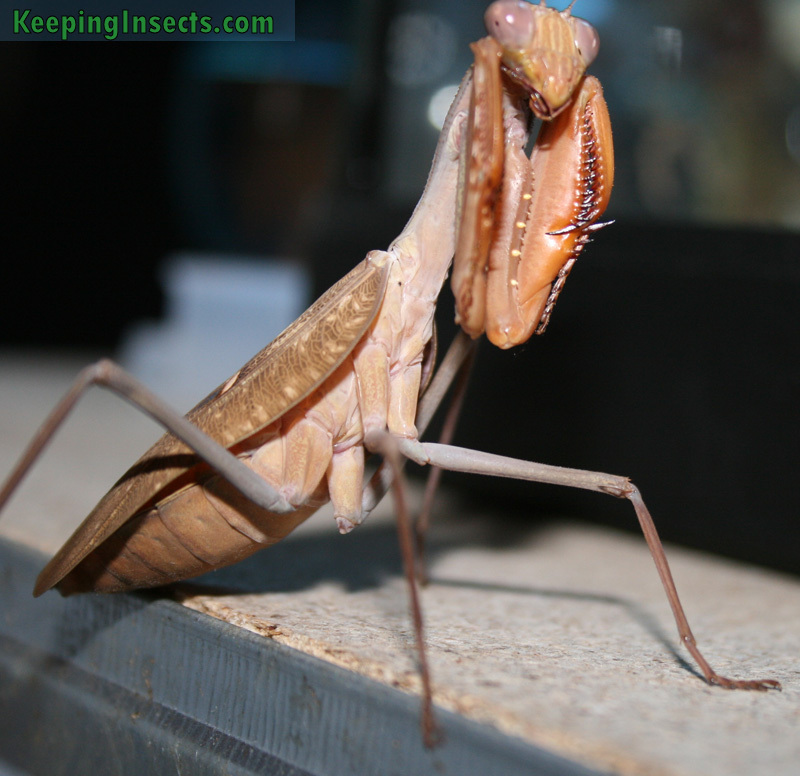 Mantises do this all the time when they are thirsty and they will not bite. But this time for some reason it saw my finger as a prey item and quickly used its front arms to catch my finger. The spikes on the arms hurt a bit, but immediately it also started to bring its head to my finger to take a bite! Ai, that hurts! I waved my hand up and down until the mantis lost grip and landed somewhere on the floor. 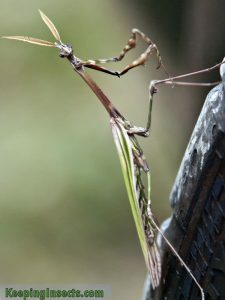 I think only the large mantis species that tackle big prey could possibly bite, for example the Giant Asian Mantis, African Mantis or European Mantis. The species that are smaller or eat mostly flies are not willing to attack a large prey like a human finger. 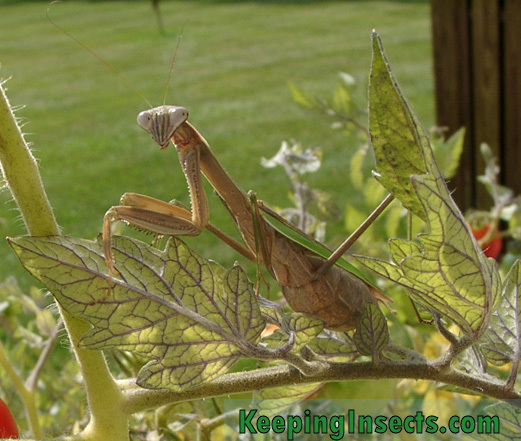 Do you want to read more about keeping a mantis as a pet? Read Caring for a Mantis. Do you want to know all the different species of mantis? Use the menu on your right!